Starting in the early eighties, Kurt Palka published four novels over the course of roughly a decade. They were historical sagas and Len Deighton-ish wartime thrillers set in locales ranging from the Canadian author’s native Austria to imperial Mexico. Equinox, one of two published under the pseudonym Kurt Maxwell, focused on the then-hot topic of contract terrorism. All are currently out of print. It’s remarkable then, that after a twenty-year fallow period, Palka, a career journalist, has suddenly published two novels in quick succession. Both the Hammet-Prize-nominated Clara (whose 2012 hardcover edition was titled Patient Number 7), a World War Two-set drama about an young Viennese intellectual whose soldier-husband is conscripted to serve the Third Reich, and his newest, The Piano Maker, are notable for featuring resourceful female protagonists. The latter begins in the 1930s in a fictional town on Nova Scotia’s French Shore. Hélène Giroux, a fortyish, French-born piano maker, has arrived hoping to take the job of pianist for the local parish. After the Great War left her both widowed and destitute from the ruin of her family’s piano-making business, Hélène had left France for England and, eventually, Quebec. A series of weighty, enigmatic references—to a jail, an institution, dreams about an accident in a “cave of horror”—and moody clichés (“There was a darkness to her suddenly. Like a great sadness”) suggest Hélène is trying to escape some kind of trauma in her recent past. And indeed, a week later RCMP officers come to announce that, in light of fresh evidence, Hélène is to be retried for the “unnatural death,” in 1929, of her American business partner, Nathan Homewood. Hélène had been exonerated for the same crime several years previously, so the news is a surprise, but apparently not a shock to either her or the townspeople: this is a novel in which people’s reactions are usually several degrees more muted than you expect them to be. As she awaits trial under house arrest, Hélène’s life story and the events leading up to the alleged crime are related through a series of flashbacks. Palka’s prose is straightforward but uninspired. Less kind things can be said of his dialogue, which is leaden and affectless. This is regrettable, since dialogue is the means through which much of The Piano Maker is told. “Conversations” are more like a series of quizzes in which characters respond “Yes,” (disproportionately) or “No,” before proceeding to formal, expository answers. “Is it the difference in our ages? It’s not that much. You are twenty-two and I am thirteen years older,” says Nathan in typical, unblinking monotone as he unsuccessfully attempts to court Hélène. Hélène’s speech is rendered without accent, though with the odd French word thrown in to remind us of her provenance, yet the English and Acadian locals deliver their lines in a hickish drawl: “Don’t you be buttin’ in now.” More inexplicably, Hélène’s 24-year-old daughter, Claire, who now lives in England, switches from calling her “Mother” to the cringingly American “Mom” about halfway through the book. The narrative sometimes falls into tone-deaf incongruities. Shortly after meeting her, the local priest asks Hélène if she knows what a cathedral is (is it possible that any adult European from this, or any other era, wouldn’t?) Later, amidst lengthy descriptions of piano construction, comes a safety-memo-type account of Hélène’s mandating of surgical masks for her staff after her mother gets cancer from solvent exposure: “In the finishing room she had a second exhaust fan put into the exterior wall and more filtered air intakes in the wall opposite.” It’s not clear if Palka, or Hélène, doesn’t realize that surgical masks don’t screen out chemical fumes. Though Hélène becomes disillusioned and angry (or Palka’s closest approximation of thereof) after Nathan cheats her out of thousands of dollars while selling the last of her precious piano wood, she nevertheless decides, when he proposes a potentially lucrative venture acquiring and selling colonial artifacts to museums, to become partners and friends with him. But it’s when Hélène effortlessly learns to commandeer a team of sled dogs so that she and Nathan can make a days-long journey into northern Alberta to retrieve an eighty-million-year-old dinosaur skull, reportedly with intact scales, skin, and tissue, that The Piano Maker veers sharply into Jules Verne, or Tintin, territory. The details of their exploits, which culminate in Nathan’s untimely, but not unnatural, demise, are relayed via the courtroom scenes (“drama” isn’t quite the word here) that occupy the novel’s last third. These involve a hawkish, chain-smoking female assistant crown attorney with “coal-black eyes,” who, in her prosecutorial zeal, forgets to establish a plausible motive. 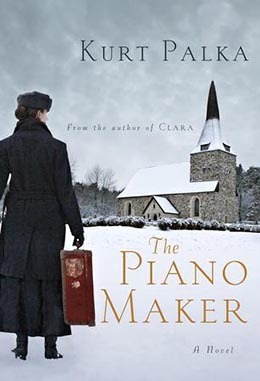 The Piano Maker is a strange book that never stops feeling like it’s written by someone making his best guess at what human behaviour and discourse look and sound like; even when ostensibly set in motion through Hélène and Nathan’s world travels, it remains static. As it moved unsuspensefully towards its conclusion, I came to see that improbable dinosaur skull as emblematic of the story itself: grandiose but hollow, with only the merest of flesh clinging to it.